The Canard Digérateur, or Digesting Duck, was an automaton in the form of duck, created by Jacques de Vaucanson in 1739. The mechanical duck appeared to have the ability to eat kernels of grain, and to metabolise and defecate them. 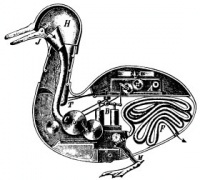 While the duck did not actually have the ability to do this - the food was collected in one inner container, and the feces being 'produced' from a second, so that no actual digestion took place - Vaucanson hoped that a truly digesting automaton could one day be designed. Voltaire wrote that "without [...] the duck of Vaucanson, you have nothing to remind you of the glory of France." ("Sans...le canard de Vaucanson vous n'auriez rien qui fit ressouvenir de la gloire de la France.") This is often misquoted as "Without the shitting duck, we would have nothing to remind us of the glory of France." A replica of Vaucanson's mechanical duck, created by Frédéric Vidoni, is part of the numerous works of art exhibited in the Museum of Automatons in Grenoble, France. A fictitious enhancement of Vaucanson's original duck figures prominently in Thomas Pynchon's historical novel Mason & Dixon. Works such as Wim Delvoye's Cloaca are indebted to the Duck of Vauncanson. Unless indicated otherwise, the text in this article is either based on Wikipedia article "Digesting Duck" or another language Wikipedia page thereof used under the terms of the GNU Free Documentation License; or on original research by Jahsonic and friends. See Art and Popular Culture's copyright notice. This page was last modified 10:21, 13 October 2013.